A maid of honor checklist will help you stay organized, as your role in the bridal party involves not only helping the bride but also keeping track of your own wedding-related tasks. Maid of honor duties are numerous, and if you have never been in a bridal party or been a bride, everything you need to do may be new, making a maid of honor timeline useful. A checklist for the maid of honor is often subjective. Some engagements are quick while other weddings may involve a longer engagement. Feel free to alter the printable checklist as necessary. If you need help downloading the printable checklist, check out helpful Adobe tips. 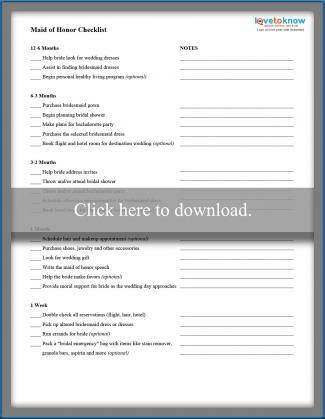 Download the maid of honor checklist. A good way to figure out whether the checklist is useful is to set up a time to meet with the bride. Go over the various points on the checklist and make notations if the bride has any thoughts or requests regarding a particular item. By using a checklist and taking notes, you will be sure you have fulfilled your role in the wedding planning process. The checklist can also help you keep track of your personal budget as an attendant. Not every bride has cheap wedding plans. Look at your checklist before meeting with the bride and then go over it after your meeting. You should hopefully have an idea of what your bridesmaid dress will cost, as well as any other wedding activities that will incur expenses, like out-of-town engagement parties or traveling for a destination wedding. Many brides-to-be keep a wedding planning checklist that helps them keep track of everything they need to do in order to be prepared for the wedding day. With all the tasks a maid of honor has, it is a good idea for her to keep a checklist, too. For example, the maid of honor often helps host a bachelorette party and/or plan a bridal shower. 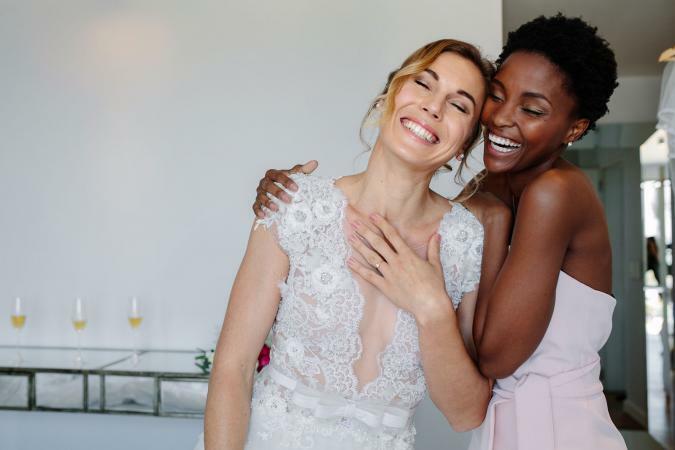 While lots of attendants realize the party planning duties, others may not think about the smaller items that go into being a maid of honor, like helping choose bridesmaids dresses or attending a wedding dress alteration fitting. Keep in mind that just because something is on a checklist, it does not mean you will necessarily be doing it. In fact, you may find yourself crossing off particular items and adding new ones. Remember that a checklist you use for the wedding as the maid of honor should not only include items to help the bride with, but items you need to remember to do for yourself, too. While it is important for you to be a right-hand woman for the bride, you do not want to neglect your own personal needs for the wedding. After all, you need to make sure your hotel room is booked and your hair is styled in time for the professional photographs. You'll want to include the maid of honor speech in your timeline, too. Use the checklist as your own personal maid of honor planner. A planner or checklist is a great way for not only the bride and groom to keep track of wedding related activities and expenses, but for the maid of honor as well. Print out a copy and personalize it for the upcoming wedding.